Bridge Cottage01263 715779work01603 870304fax Self-cateringThe modern and original are stylishly combined in this 19th Century cottage in historic Aylsham. With the beautiful Norfolk countryside and a delightful courtyard to relaxing courtyard, Bridge Cottage is the perfect property for a romantic break or a longer stay. • Other: Towels, Books, games and radio. Steep stairs in keeping with age of property. 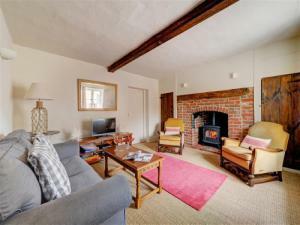 The modern and original are stylishly combined in this 19th Century cottage in historic Aylsham. With the beautiful Norfolk countryside and a delightful courtyard to relaxing courtyard, Bridge Cottage is the perfect property for a romantic break or a longer stay.